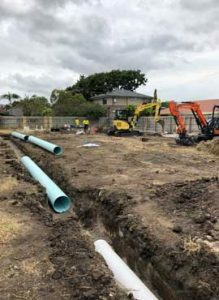 Lateral Plumbing Solutions offers various pipe solutions in Melbourne for broken or damaged pipes buried under compacted ground, including innovative trenchless pipe replacement as well as more traditional pipe solutions. Our specialists can restore the condition of your pipes, helping to avoid unnecessary damage and restore the function of your plumbing. Pipe Relining – This approach can be costly and is typically reserved for pipes located in hard-to-reach areas, such as underneath buildings or within close proximity to important infrastructure. Pipe Replacement – This traditional method is often more suitable and cost-effective than relining, especially when the affected pipes are easy to access by digging. Replacement is also preferable for pipes with significant sag issues or alignment problems that need rectifying. Lateral Plumbing Solutions offers pipe replacement for broken pipes as an alternative to pipe relining and stormwater pipe repair. We also offer a trenchless option using boring and directional drilling. To learn more about our services and to find out more about directional drilling vs. horizontal drilling, contact us today. Lateral Plumbing Solutions can provide assistance with a variety of pipe solutions in Melbourne, including pipe replacement, leak detection, pressure jet drain cleaning services, directional drilling and more. Contact us today for more information.